This plate is from the Museum of Fine Arts Boston, 44.1519. 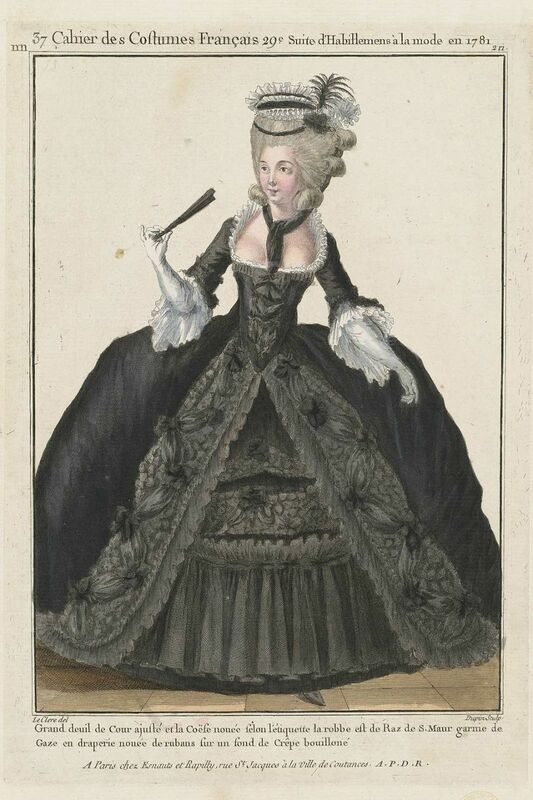 I'm trying to learn more about 18th century fashion and your blog seems to be a great help and inspiration with it. Thank you so much for doing these translations! Do you mind if I link your blog to my next post? I'd like to use couple of pictures you have here as examples. I just tought I should ask you first. Hi, Louis! Thank you so much. I don't mind at all if you link to me, and if you want to use these images, go ahead - the one thing I'd ask is that you upload them to your own blog rather than hotlinking, and that you link back to the MFA where possible. Fascinating. The matte effect is very nice. The bouillionee crepe on the skirt robings -- or are there parements? -- is really neat; I love how the gauze puffs play off them. Wonder how one would do those? If it were me, I'd cut long strips of crepe, turn the long sides under, starch them well, and sew down little puffs in a random pattern all down the skirt robings. Oh dear, I am certain I have the terminology wrong for the vertical decoration down the edges of the robe. This is one of the more effectively trimmed court dresses in the series so far. I would call them parements, since they're such wide bands and look to be just trim applied on top. Your method sounds about right to me! Or maybe it's meant to be ruched in a grid?